Foldover clutches are cute, and a really nice way to carry the style. But the standard ones are rectangular-shaped and flat, therefore not allowing much room for toting extra stuff. Jalda's Julie Fold-Over Clutch is a magnificent, pouchy clutch. The style boasts an innovative shape - a boxy, pleated bottom which retains the cute factor while adding more practicality. 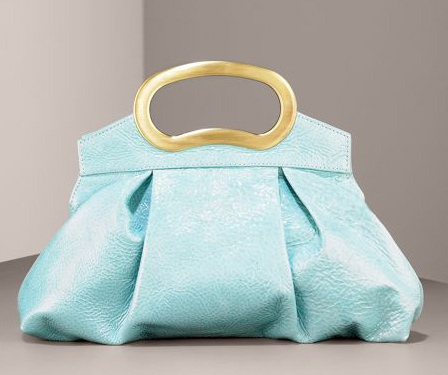 The bag is topped detailed with Jalda's signature bean-shaped metal handle and comes in a sky blue patent leather which makes it especially divine!